Now, you may be wondering why I started including time management tips for moms in a section that’s supposed to be about Homemaking. For me, time management is crucial to homemaking. I need to balance my hours properly so I’m getting everything done during the day. Between blogging, chasing after a toddler, and homemaking- there’s not enough hours in the day! Or so it would seem. 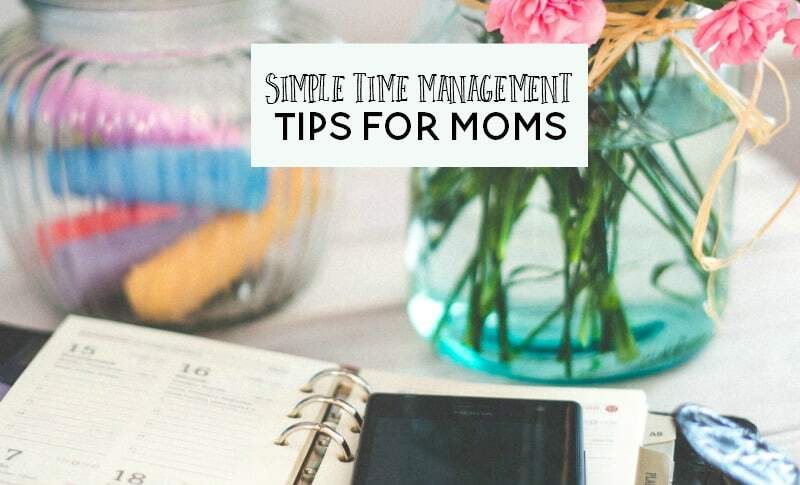 Today, I want to share simple time management tips for moms to make the most of the time you have. Unsure of how much time each task is taking? Start recording it and keep a time management log. Sometimes it may be a bit scary (or the wake up call we need) once we realize just how much time we’re spending on tasks that we thought were simple and would only take us a minute or two. I know that my time management skills could definitely use some work, which is why I’m also creating a time management plan that will work for me when it comes to balancing home and work life. Saying no is probably one of the most important things you’ll ever learn to say. The problem is our parents disciplined the word “no” from our vocabulary. It’s time to learn how to say no again. If something is not right for you, is too “urgent”, causes you stress, or you just do not want to do it and it doesn’t fit in with meeting your goals, say no. Saying no will free up untold amounts of time to focus on your priorities. Unplug the phone, turn off email notifications, and for goodness sakes get off Facebook. If you’ve not completed the most important tasks on your daily list, you have no business messing around with technology. The idea of multitasking is overrated, so unplug and tune in to the tasks at hand. You’ll work faster, smarter, and gain the time you need for other things. If you need to, use a kitchen timer to help you keep track of time. Your priorities need to be added to your calendar. Everything from the 15 minutes you need to use social media for marketing purposes, to the one hour you take your kids to the park, needs to be put into your calendar. If you have a project due in a week, you should have five days of scheduled time to work on the project prior to the due date. I use time blocking in my time management plan and it’s made a huge difference. Unless the house is on fire or a child is bleeding, the telephone ringing and the knocks on your office door are not important. Check your email at scheduled times during the day, explain to your children, spouse and family when you are working, and otherwise ignore the door bell ringing. If you didn’t schedule it, you don’t need it. Obviously, if you have younger children, you may want to rethink a few things. Whether it’s the housework, cooking, or customer service, it’s important to outsource what you can afford to outsource. There are huge payoffs to outsourcing the things that are simply time suckers from your day. If you can’t afford to outsource, your kitchen will not explode if a few dishes pile up, and everyone can do with eating a salad for dinner. For bloggers, consider getting a VA to help. Multitasking is not really a bastion of efficiency. Instead, seek to touch each task only once and finish it. For example, when you check the mail immediately throw out the trash, schedule bills to be paid, and deal with any issues that came up with a letter – right then. Of course, your mail time should be scheduled as well so that you can stay on track. At least twice a day, set out the time to check your schedule. Usually the morning is good and at the end of the day is good. Ensure that you have your priorities in order, add anything new to your schedule that needs to be added, and remind yourself of what is expected the next day. Checking your schedule helps you feel accomplished at the end of the day, and reminds you of what’s coming up tomorrow. By using these simple time management tips, you can make the most of your day and the time you have.